There are birds which migrate and then, there are birds which do not migrate. Of course, this makes perfect sense, but in the world that I had created in my mind, and which is quite often wrong, all birds migrate. This just seems how Nature should work. You can imagine my surprise last winter, as I jogged along the causeway in Essex, to spy a flock of random geese foraging in the long dead and brittle grasses of the salt marsh. That winter had been unusually warm, so I suppose the geese had yet to feel any compulsion to leave, but it struck me as peculiar. Everything else in the marsh had prepared for winter: the grasses had died, the mosquitos and green heads had long since vanished, the fragrant sea roses of the summer had pulled down into the ground preparing for the winter cold and yet, there were these geese murmuring softly through the waters, completely oblivious to the fact that it was winter. I had one of those rare moments of quiet. No children knocking on the bathroom door, no little voices asking why I was taking so long, nobody declaring they hated the dinner I had made and could they have yogurt instead, not that I have anything against yogurt, but I am baffled as to how a 5 year old manages to thrive on yogurt, toast and oatmeal. Nobody tugging at the sleeve of my shirt. No spilled milk to mop up. Just perfect stillness. I later asked Erin about the geese and she casually mentioned that they were Canada geese and that they had migrated to the marsh at some point and well, just decided to make their home there. I asked if they ever migrated and she thought about it for a bit and then told me that they had just appeared one day and then never left. I realize that Canada Geese are typically considered a pest; they can be loud, aggressive and territorial. The Canada Geese near my home in California will attack you if they smell even the slightest hint of food on you, but I have a soft spot in my heart for birds, particularly those birds who are considered lowly and mundane (I’m looking at you, pigeons. Seriously. Pigeons: The Fascinating Saga of the World’s Most Revered and Reviled Bird is a must read). To be fair, the geese don’t pose as much as a problem in Essex. They stick to the marsh and leave the humans alone and the humans leave them to their own devices. I know that not everyone cares for Canada Geese and rightly so, but I admired their quiet determination in the salt marsh. It was that very winter that Erin and I decided to re-imagine our Love Birds in a warm, cuddly alpaca. I would like to say that the idea was entirely our own, but we really must give some credit to those geese. Not everyone loves Love Birds, but they are special to us and in many ways are our namesake wrap. It is the one wrap that truly combines the best of Oriole and Pavo and because of that, Love Birds is dear to us. Love Birds Lavender is woven with our signature ivory, extra long staple Egyptian cotton warp with a rich, lavender alpaca fill. The lavender isn't just any old, boring lavender: it's a beautiful blending of magenta, sky blue and warm lavender alpaca threads. It gives our Love Birds Lavender a unique richness and luster Our alpaca is exceptionally fine, soft, cuddly, and has a natural sheen to it. It is quite warm, yet lightweight and its hypoallergenic properties make it a good choice for those who have wool allergies. Alpaca has a reputation as being a more time intensive fiber in regards to care. I suppose that’s true to a certain extent and care can look daunting at first, but all our alpaca needs is a a gentle swish in the bathtub or sink with a bit of your favorite woolie wash. Rinse until there are no more bubbles and gently roll up your alpaca to remove excess water. After doing this, I prefer to lay out a large beach towel and lay my wet wrap on that and roll up the towel with the wrap inside to soak up as much water as possible. I then hang to air dry, making sure the wrap is supported throughout its length. You will find that after a bath, our alpaca fluffs up and becomes quite soft. Love Birds Lavender has a gorgeous, thick fluid drape in hand. It provides a soft cushiness on the shoulders while providing solid support for those wrapping toddlers. Although Love Birds Lavender is an alpaca blend, it still provides good stretch and rebound, much like our cotton Love Birds. It will most certainly keep you and your little one warm while trekking out on snow days or in gloomy winter weather. Have a Golden Ticket you would like to use? Fill out the Golden Ticket Request Form here. My thanks to Tracy and Brianna who offered us their insight into Love Birds Lavender and to Dana and Natasha who offered editorial input. You ladies are the best! I know a lot of people don't care for the birds. We've been told their eyes are creepy. Their feet too sharp. Their beaks poised to bite someone's finger off. I still love them. Lets be real. Birds can be assholes sometimes. Ever tried eating food at the beach? I rest my case. But a considerable amount of time was spent reconfiguring the eye, the beak and the feet. I feel we have a softer, more contemplative Love Bird, which seems fitting for this time of year. I know we might not always acknowledge it when you make suggestions, but we really do listen to you! Just look at that gorgeous melange of magenta, sky blue and lavender alpaca threads! Link. Published on December 09, 2016 by Pavo Textiles. I am incredibly grateful to be part of blended family; a family who has always included me in their familial traditions and culture since I was a young child. We share these same traditions with my own children so that they learn to honor a culture of which they are so very much a part of, but to which they simultaneously do not belong. When we sat down to discuss design, it was second nature to suggest a design based on the intricacies of Otomí embroidery and the beauty of hand cut papel picado. These have been a part of my everyday visual culture ever since I can remember. Pavo is, first and foremost, a family business. Our design decisions are not made in a vacuum. Designing wraps based on traditional Mexican artwork was a way for me to honor my family; it was a way to visually acknowledge their importance and how much they mean to me. We consider charitable giving a private act, one not done for accolades, but because it is a key tenet of our shared philosophy of valuing the social good which can be accomplished by ethical charitable giving. The new year is a time for reflection however, and we thought we would offer some insight into why we give, what organizations benefit from our giving, and which of our products make it possible for us to donate. Before our version of Otomí went on the loom, we considered how to best make use of the funds from the sale of the wraps; we knew we couldn't share our appreciation for the skilled and complex textile design of Otomí embroidery without giving back to the communities that are responsible for creating this artwork. We decided, before Otomí was even woven, to give 100% of the proceeds to an organization that could reach the Otomí people. We had a difficult time finding an organization that had the necessary economic tools and resources to funnel large sums of money directly into the hands of Otomí women in a way that was both culturally sensitive to the dispersal of money in these communities and that would also insure that women were being aided in way that was safe and empowering. It wasn't until Otomí was woven and after much consideration and input from friends, family, and good old fashioned research, that we decided to donate to the International Development Exchange, with the specification that it be donated to those projects aiding and empowering indigenous women in Mexico. 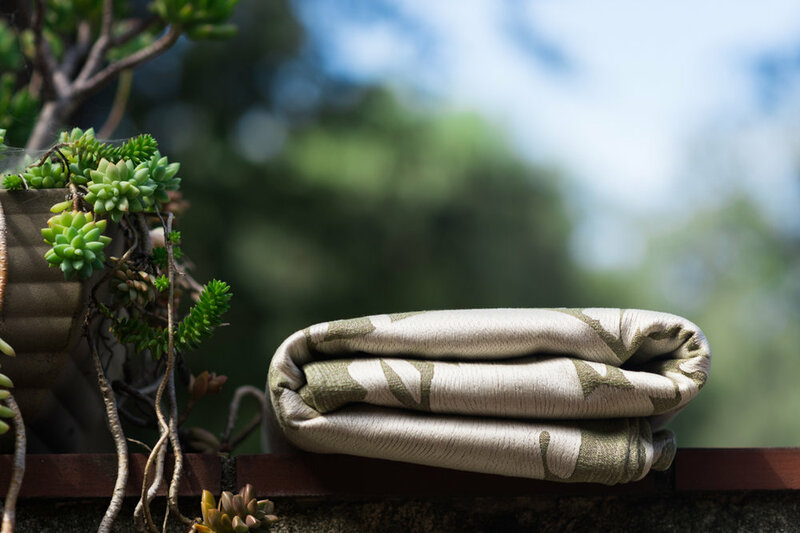 With the release of Otomi, we realized that we could make an even greater impact by also donating funds from Unicornio and De La Sol to IDEX. The money from these releases allows us to continue to donate to IDEX and other organizations, such as Grassroots International. We are in communication with IDEX and receive regular updates on the work they are doing. We are deeply invested in the work IDEX does, particularly the work they are doing to insure economic parity for indigenous women in Mexico. Going forward we will work with our family members and artists in Mexico to generate artwork for our next generation of wraps. We will continue our charitable contributions which have made a great impact on the work IDEX is able to accomplish for indigenous crafts women in Mexico. Donating is not simply our desire; it is our ethical obligation. Our search for charities remains ongoing. We are always open to new suggestions, if you have a found a reliable way to directly donate to Otomí women, or if you have another cause close to your heart you think one of our patterns could support, we would absolutely love to hear from you. You may contact us here. Link. Published on January 22, 2016 by Pavo Textiles. When I was preparing to move to Essex, I bemoaned the fact that I would have to rent a car for the entirety of the summer. Erin laughed and told me there was no reason to rent a car. I immediately panicked. I am born and bred in Southern California, the epicenter of freeway culture. What would I do without a car? How would I do anything? But, I trusted her wisdom and did not rent a car. This would turn out to be one of the greatest decisions ever. The apartment I had rented in Essex was a little over a mile away from the Studio on Western and though the mornings still had a bit of a chill to them, I would head down Southern Ave to the causeway (past the Toy Store, which would soon be Pavo's new home) and then jog over to Western Ave and to the Studio. There was a rhythm to those morning walks and although I always took the same route, I never became bored; it was always different: the salt marsh looking as if it were getting ready to burst with high tide, the cormorants sitting on the edge of the marsh, waiting to pick off small fish as the tide went out; the chefs at C.K Pearl putting meat in the smoker at the back of the restaurant; the workers at Woodman's bringing in fresh lobster and haddock; the large moving van dropping off antiques in front of Bider's Antique Store. All these things were new to me. I love Southern California. I was born here and raised here. It is large, sprawling, and to a certain extent, anonymous. I love this about where I live. But there in Essex, life functioned on a smaller and more intimate scale. It was absolute love at first sight. The walks back and forth between the Studio and my apartment soon turned into early morning jogs and long evening walks. I feel in love with Apple Street and found that I could make a complete loop from my apartment to the Studio by cutting through to Southern Ave via Apple Street from Western Ave. I did this five mile loop in the morning and if I was able to leave Western Ave before dark, I did it at the end of the day (too much convivial conversation after a wonderful dinner cooked by Stevil often meant that didn't happen). At some point during the summer, I told Erin that I intended to run an ultra marathon. I think I said this while stuffing a lobster roll in my face and imbibing my third martini. I might have been drunk. No, I was definitely buzzed, but the seed had been planted. She didn't tell me that it was a bad idea. She didn't tell me that I was setting myself up for failure. She didn't tell me I needed to lose fifty pounds. She didn't tell me that there was a chance I wouldn't make my goal. She simply nodded and said: "I will do it with you." Somewhere along the way, we revised our immediate goal to a marathon and by immediate, I mean we gave ourselves a year to train for a marathon. We really focused in on training about three weeks ago. It hasn't been easy, but we are doing it with the hopes of completing the Asheville Half Marathon on Saturday, March 12 2016. I have always hated running. It was boring and dull. Just pounding the pavement one foot after the other, but this past summer has changed that. Now that most of our waking hours are filled with Pavo, it's good to have that quiet time to reflect and be at peace. With that being said, is anyone interested in joining us as we train? Head on over to the Nike Running App and look us up (runmunsrun and Erin A.) I will be staring a new #runpavo challenge on Monday, October 12. Nothing hard or over the top. It will just something to keep us all moving and working toward a goal, whatever that may be. Link. Published on October 08, 2015 by Pavo Textiles. We are headed out to Texas tomorrow and are so excited to meet with our Texan Pavotees during International Babywearing week! The trunk shows are shaping up to be two wonderful events. San Antonio is going to be intimate and cozy: champagne, cheeses, chocolates and warm comfy sofas. It will give us a chance to sit down and talk with our San Antonio Pavotees, sort of like a girls night out. There will be time discuss development and future projects with attendees. We both love these types of events because it really give us a chance to connect with Pavotees. Due to the enormous response to the Austin event, we have had to reserve an additional room in order to accommodate the number attendees. We will have light fare and drinks while we mingle and chat with Pavotees. We are looking forward to seeing new faces and visiting with old friends. Would you like to join in on the fun? Grab your ticket here. We have wraps that will only be available to San Antonio and Austin attendees, VIPavotee mugs, and great company! Link. Published on October 06, 2015 by Pavo Textiles. There is a lot of hustle and bustle at the Toy Store as we head into autumn and say goodbye to perhaps one of the most beautiful summers ever. The #summerof[spending]money has come to an end and we are both settling back into work on our respective coasts. So what do we have in plan for the rest of the 2015? We’re headed out to San Antonio, Austin and Seattle for the start of an amazing trunk show tour, Pavo Presents, which gives us the opportunity to hang out with our amazing fans. We have our annual fall trip to the Oriole Mill coming up next week. We will be shipping out the second TPS exclusive, Penumbra Veronica, by the end of the month. We are in the planning stages for our first Pavo Holiday Party at the Toy Store. We are burning the midnight oil planning for the New York Baby Show and the International Babywearing Conference 2016. We finalized dates for another #summerofmoney in 2016. And of course, the reason for this post: The debut of the Pavo Guild Subscription Box, which we have affectionately dubbed Pavo 'Scrip in house. What exactly is the Pavo Guild Subscription Box and why exactly are we doing it? A number of people have asked if we could do some sort of subscription service; we tabled the idea right from the start. Too much work and too many unknowns. Which wraps would we offer? How would logistics work? Would people even be interested? But we kept being asked about the possibility of a Pavo Subscription Service and while we were hesitant, the idea came up again during one of our work lunches this summer and the question was asked, well why not? Why not work out the details? Why not make a plan? Why not work out logistics? If we couldn’t make it work, well then, at least we could say that we tried. And well there you go, we figured out how to make it work, so we are quite pleased to be offering a Pavo Guild Subscription Box. So on to the all details. What wraps will be included in the Autumn 2015 subscription service? Pavo Guild Subscription will be available on October 1, 2015 at 14:00 EDT. Please note that the prices stated above are subject to change and do not include relevant state tax, customs fees and associated shipping and handling costs. We are currently working on the 'Scrip box for Winter 2016 and details will be available in the late December 2015. What would you like to see in forthcoming Pavo Guild 'Scrip box? Link. Published on September 17, 2015 by Pavo Textiles.